Suddenly, there is a loud sizzle. You drop the book and rush to the stove. Too late. The pot... it's boiling over! All of that sauce, the sticky mess, down inside the stove. It'll never come clean. The horror. With the Maytag's sealed tempered glass top, spills won't get inside. Their removable burner caps and temperature control knobs make all parts of the stove easy to clean. The burner grates are coated in porcelain for a better look and more cleaning ease. Edges of the surface keep spills contained, so they don't flow onto counters or your floor, either. Gas can be scary for some, a pain for others. 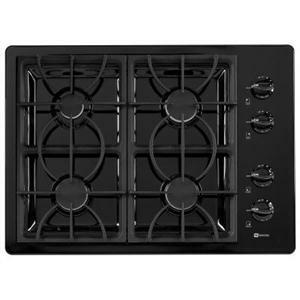 With no pilot light to worry over, this cooktop will end your concerns. You won't have to lift the top to relight the stove. Electronic ignition lights each burner as you need it. The PowerBoost burner offers additional BTUs for faster boiling and heating of large pots, but Maytag also supplies a lower heat-producing burner for delicate items.